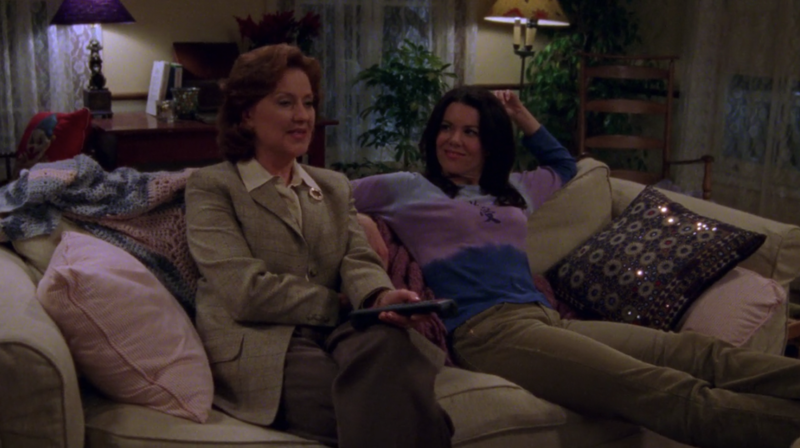 While binge-watching Gilmore Girls, it's plain to see that Rory and Lorelai actually invented binge-watching. The masters of a movie marathon, they know just how to snack up and bring in the perfect takeout for the occasion, which is impressive commitment in the days before Netflix and Seamless. From a health perspective, they should be dead. Or, you know, two twinning, blue-eyed Jabba the Hutts. I'd watch that show, for sure. We picked out some film and food pairings ripped straight from the show tro inspire your next night in. Pair With: Marshmallows, jelly beans, chocolate kisses, cookie dough, peanut butter, Red Vines and a pizza with everything on it. 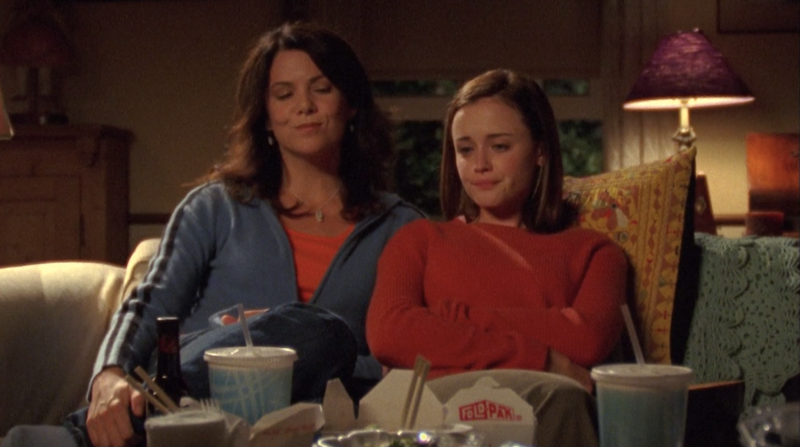 “You can’t watch Willy Wonka without massive amounts of junk food, it’s not right.” This is Lorelai’s philosophy as she tries to drag her freshly-first-kissed daughter into Doose’s Market. 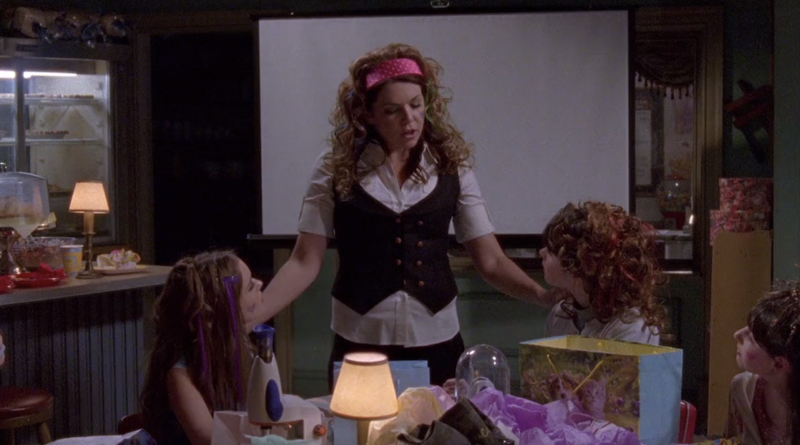 Rory is terrified Lorelai will embarrass her in front of her crush, but Lorelai is the coolest of cool... until she invites him to their Willy Wonka Diabetes Party. Whoops. Still, this is a perfect Gilmore pick if you’re ready to dive into the deep end. 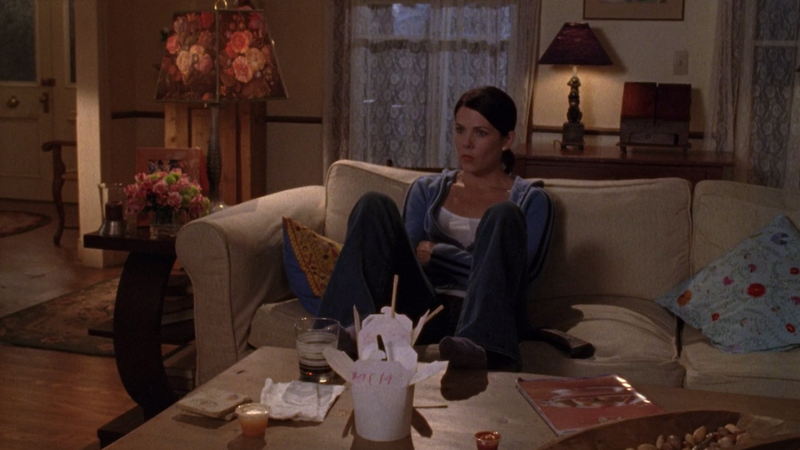 P.S., Lorelai spends $41.83 on these anti-nutritional groceries, how insane is that? “Yeah.” And at that, the Gilmores' smiles fade away. A possible double feature? At the end of “A Messenger, Nothing More” Rory comes back from her EuroTrip with Emily and manages to obliterate Dean’s marriage within the first, what, 48 hours of her return? She’s, you know, pretty bummed about that, especially when Lindsay’s mom goes loco on her and Dean has some choice words as well. I mean, can’t blame them. 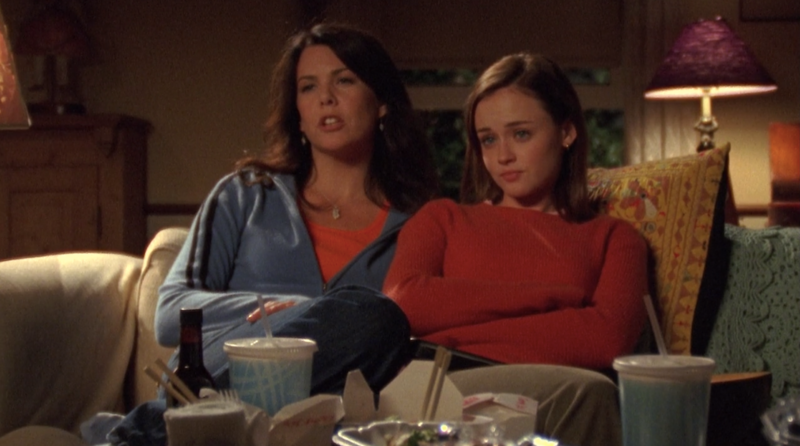 In any case, Lorelai says they should medicate with Showgirls and a next-level platter of take-out. Rory instead shows Lorelai her “home movies” from Europe: the Maggie Smith and Helena Bonham Carter flick Room With a View. Pair With: Pumpkin pie and whipped cream, burgers and fries, Chinese food (my God, always Chinese food) and beer. 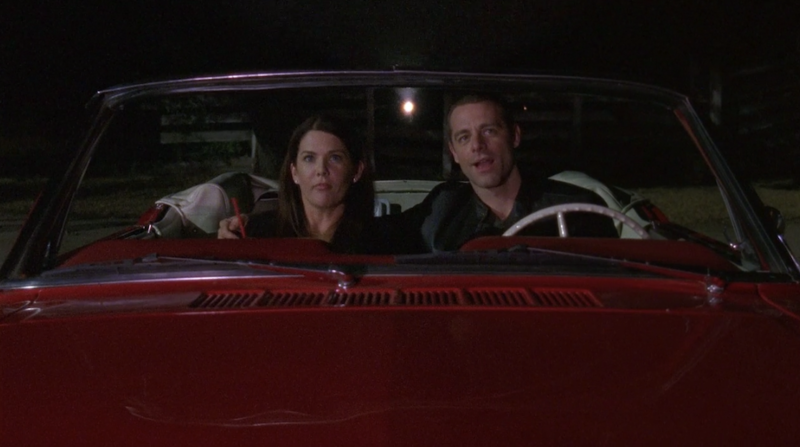 Lorelai is gobsmacked when Luke says he’s never watched Casablanca. What turns into a casual movie night invite becomes a sacred ritual, because you don’t mess with a classic like Casablanca. 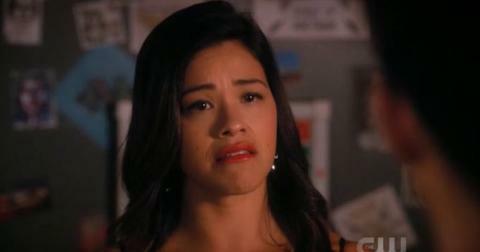 She also orders back-up Chinese food half-knowing that Luke, being Luke, will bring over some bags from the diner. You don’t have to go that crazy, just remember the rules: no talking! Pair With: Slurpees, popcorn, and assorted candy. Not super big on Christopher — or the majority of season seven — yet I have to give snaps for his drive-in movie date. It’s super romantic to do a viewing of the Audrey Hepburn classic. Even though Fred Astaire was like, 80, he can dance! Slurpees seem like a weird choice in the wintertime, but maybe you can get some colorful, sugary treats to compliment that whole “Think Pink” sequence. Pair With: Chili, fries, popcorn, and soda. I’m sure this movie is worth watching if only for that weird opening song. The Lorelais manage an impressive duet performance onf their ill-fated double date at the Red, White and Read. Some chili that can sit well for a while is highly recommended. Leave the boyfriends at home. Pair With: More Chinese food? Or, if you're over that by now, pie and coffee from Weston’s. I know, I know, you’re all gaga over Lady Gaga. 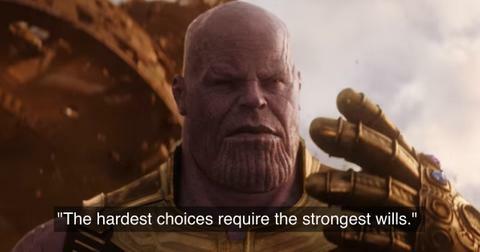 Let me tell you, though, the previous three versions offer tremendous showcases from each lead actress. Sookie is partial to the Barbara Streisand version, while Lorelai gets swept off her feet to Judy Garland’s “The Man Who Got Away.” Swoon. Not 100 percent sure what a “fiesta burger” is exactly, I’m sure you can add some spices to your usual patty and call it a day. 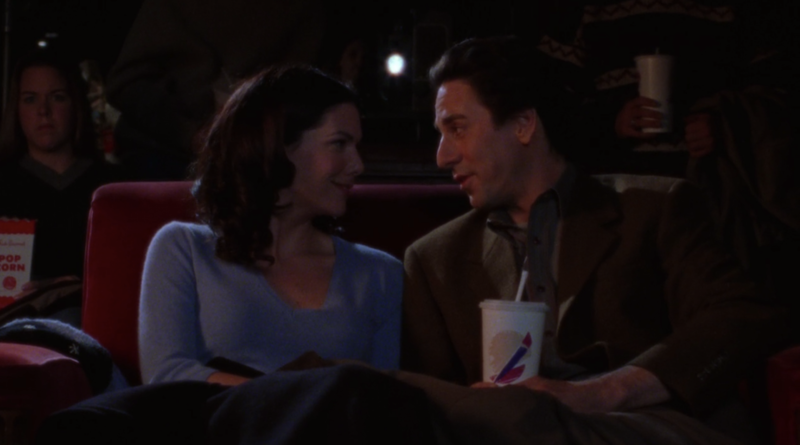 Whatever it is, Lorelai and Max Medina (remember Max? 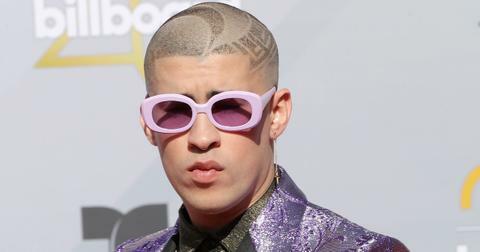 Maaaax Medina?) watch this horror classic on their World Series-level first date. Pair With: Mashed banana on toast and burritos. Emily and Lorelai share a rare bonding moment when they’re watching Double Indemnity together, the iconic noir film in which Barbara Stanwyck and her lovely, husky voice convince Fred MacMurray to murder her husband. 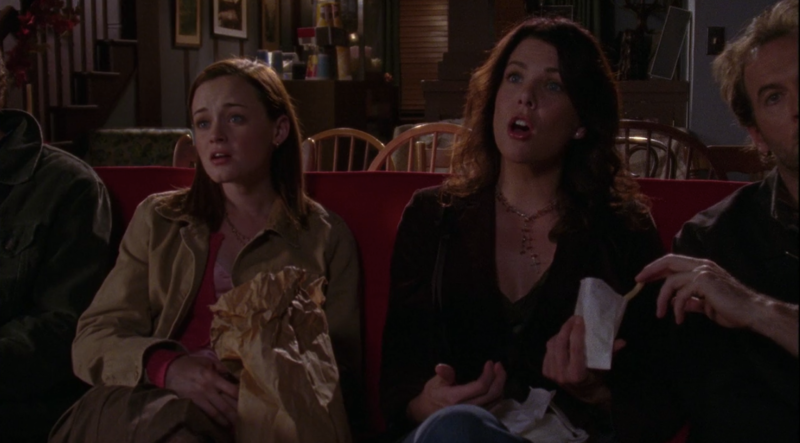 Emily also swears up and down that Lorelai demanded mashed banana on toast whenever she was sick, and spoiler alert, it tastes awful. Feel free to skip to the frozen burrito if you want (although maybe heat it first). Pair With: Potato chips, pizza, and birthday cake (you can pick the flavor, it’s your life). '80s child Lorelai seems to be a big, big fan of the timeless teen flick; it’s referenced more than a few times on the show. 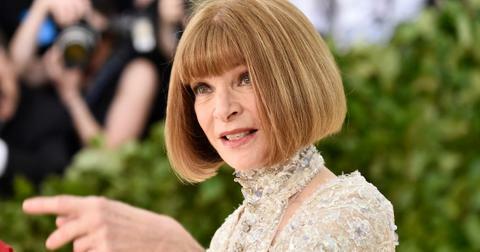 She introduces it to a group of young'uns at April Nardini’s birthday party, dubbing Molly Ringwald her Audrey Hepburn. 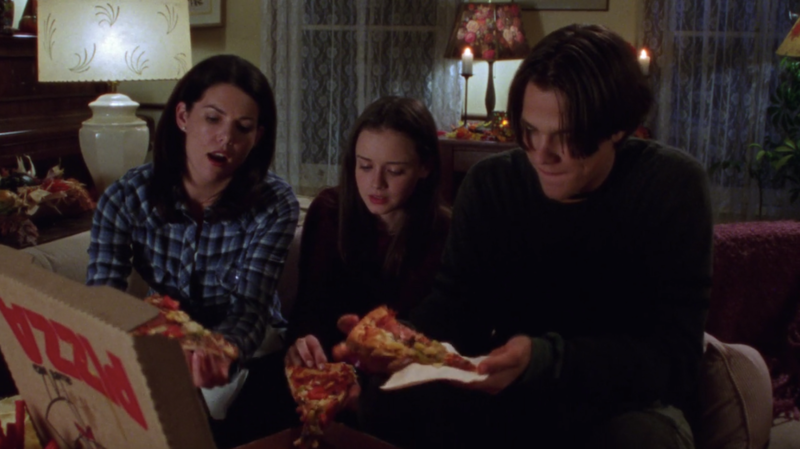 Even though this party marked the beginning of the end for Luke and Lorelai, we have to admit that junk food and John Hughes always make a good combo.